Our proposals are currently subject to a detailed Transport Assessment (TA) which will identify the impact of the proposal on the surrounding highway network. The TA is being produced in line with applicable local and national guidance, and in consultation with Herefordshire Council, as the highway authority for the area. The impact of the proposal on the wider transport network will be limited, as the majority of site traffic will already be on the highway network regardless of the development, either visiting other retailers, or undertaking other trip purposes. Research undertaken by TRICS (TRICS Research Report 95/2 – Pass-by & Diverted Traffic – A Resume) concludes that in most circumstances, 10% or less of the total trips associated with the surveyed new stores were completely new to the network and that in practice the value is so small that it can be discounted. Notwithstanding the above, the TA will ensure that a robust analysis is undertaken. The site benefits from excellent walking and cycling links to the town centre which will assist in promoting linked trips amongst customers and sustainable travel amongst staff. As part of the planning process, Lidl will liaise with the highway authority to ensure that any opportunities for enhancing the existing sustainable transport infrastructure are fully considered. 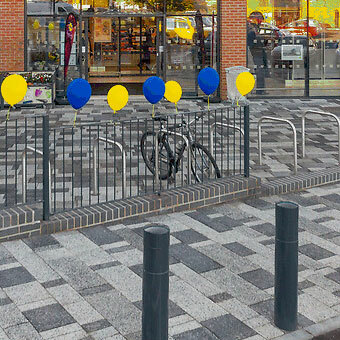 Covered cycle parking spaces (30 in total) will be provided in a secure and convenient location for use by staff and customers. In order to reduce dependence on single-occupancy car trips associated with the site, a Travel Plan will be provided to help promote sustainable travel amongst staff and customers. It is envisaged that the Travel Plan can be secured by an appropriately worded planning condition. Travel Plans present the opportunity to raise awareness of the consequences of travel choices, the benefits of alternatives such as walking, cycling and public transport, and methods to minimise the impact of private car travel on the environment. Access to the site is proposed via the existing priority T-junction arrangement on Alton Road which served the previous site use. This junction, along with nearby junctions considered to be sensitive to traffic increases, will be subject to detailed capacity analysis as part of the TA and mitigated if necessary to ensure highway safety and operation is not compromised.